Today, I looked in the mirror and decided it was time. Time for the change I have been needing for months; a change that everyone who has laid eyes upon my dishevelled mass of duotone hair knows I have been needing for a while. Yes, it was time for a haircut. This may not seem like such a big deal. Okay, so you go and sit in a chair for fifteen minutes while some guy with scissors snips a few hairs from your head. Everyone does it. For some people it is an event to look forward to. Well for me it’s a f*cking nightmare. And I let my fear gradually build. For weeks I’ve been finding the courage to sit in the chair. Eight years ago, I would have been proud of the fringe that caused partial vision. The back of my neck has been cosy during the winter months. But I’m twenty-four and there is no excuse for a messy, unkempt mass of hair. Or is there? 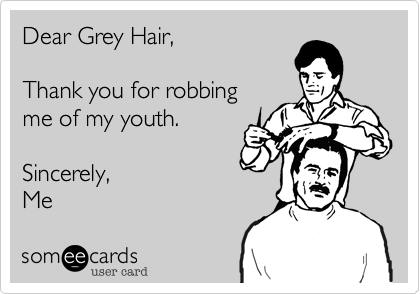 The problem for me is, quite simply, I am going grey. I have been going grey since I was about 16. I still remember that fateful day. Finding a small collection of greys on the side of my head, telling myself it was not real, that yes, my dad went grey young, but that doesn’t mean I will too. So there I was today. A stranger buzzing his clippers over my scalp, asking me if I preferred ‘natural or square’ (FYI, I opted for square), using his fingers to estimate an inch-and-a-half off the top. How the hell am I meant to know? 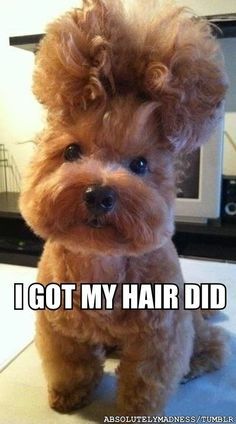 You’re the bloody hairdresser! I was too focussed on my lap, shrouded with a black cape highlighting the masses of grey hairs scattered everywhere. And in that moment I knew it was all over. People tell me to embrace it, accept it, everyone likes a silver fox. Think of George Clooney or Phillip Schofield. I’m more of a Steve Martin. Remember your weird crush on Steve Martin? Of course you don’t. Lead me not into temptation but deliver me from the hair dye aisle in Boots. And so the main problem with haircuts, aside from another person touching my head (which is something I cannot bear), is that with each one I become greyer. It’s more visible. I’m 24 and I’m at least one third grey. Soon it’ll spread. I know it will. I am no longer in doubt. First, maybe, it’ll reach my eyebrows. Then, it’ll got to my facial hair, maybe further south to my chest, maybe further south still. Who am I kidding? Maybe? Definitely. So I am writing this while I still have more brown hairs than grey. Future Dan will look back at this and think It was a simpler time. And there we have it. A quarter-life crisis in action. I know I’m still young, but I wish somebody would tell my scalp.